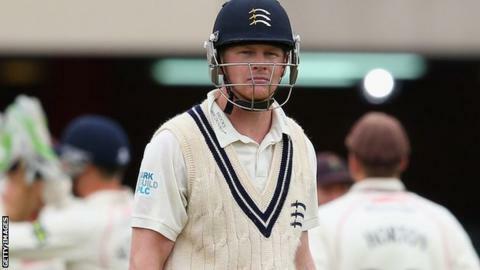 England opening batsman Sam Robson has signed a one-year extension to his contract with Middlesex. The 25-year-old, who made his Test debut against Sri Lanka in June, will remain at Lord's until at least the end of the 2016 season. "Sam is the sort of player any club would want to build their future around," Middlesex managing director of cricket Angus Fraser said. "He has developed into a high quality cricketer." Robson broke into the Test side set-up after being included in the England & Wales Cricket Board's elite performance programme last winter and subsequently impressing for the England Lions. He scored his maiden Test century in only his second appearance, but despite being an ever-present throughout the summer, has struggled since then and his 336 runs in seven games have come at an average of 30.54. Australia-born Robson was not awarded a central contract for 2014-15 by the ECB, has been included in a 14-man England Lions party for their January tour of South Africa. "I am delighted to sign a new contract with Middlesex, especially after what has been an incredible 12 months for me," Robson said. "I am looking forward to building on this and am sure my best is yet to come. "I am very grateful for the support Middlesex have given me over the last seven years and look forward to continuing my career with this great club."